e-Learning authoring system that includes interactive course designer and screen recording functionality. Zenler Studio Reviews Recently Reviewed! The solution I needed. No less. Pros: It's easy to use, to manage and organize. No fuzz about complicated instructions. You have your own online school in a few clicks. perfect if you produce your own content. You can create coupons for your courses, customize your landing page, about page and front page easily. Manage students and instructors never have been so simple. Overall: I became the manager and administrator of an online school without any software knowledge at all. I gain independence and my knowledge production is now mine. 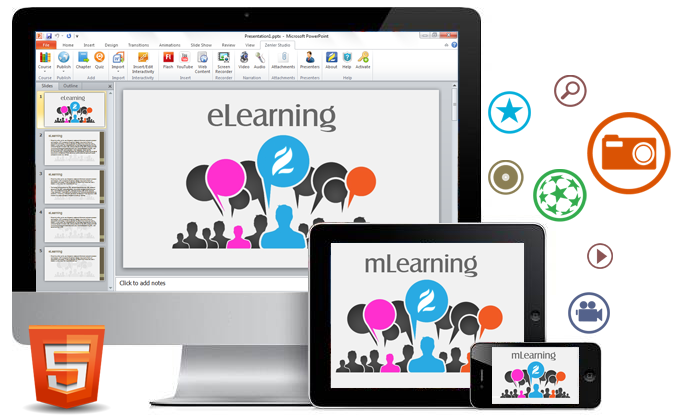 Great and powerful eLearning authoring tool! Cons: As you start using it, you will find it has lots of functions and features. Sometimes its difficult to search and find the specific option you need. But.... If you contact them, they will help you ASAP! Besides, you cal always watch youtube tutorials! Overall: Creating awesome eLearning pieces in no time.... And you wont need an expert to do so! Zenler helps you design your information! Pros: In our organization we were accustomed to using software such as PowerPoint or Keynote. Once we discovered this software we find it extremely useful and it helps us a lot. It accepts almost any document format !! Cons: Once you start using it, you are extremely excited about everything that helps you, however, since it has so many functionalities you can lose it by looking for some specific ones. Pros: The opportunity to grow your audience, sharing knowledge and making money before investing it. Customization options and overall design. Responsiveness. Cons: Sometimes I find hard to find the options I'm looking for. It could be easier to use by having different templates or more drag and drop options when designing schools. Overall: Creating my own school by myself, reaching wider audience and feeling like a pro.